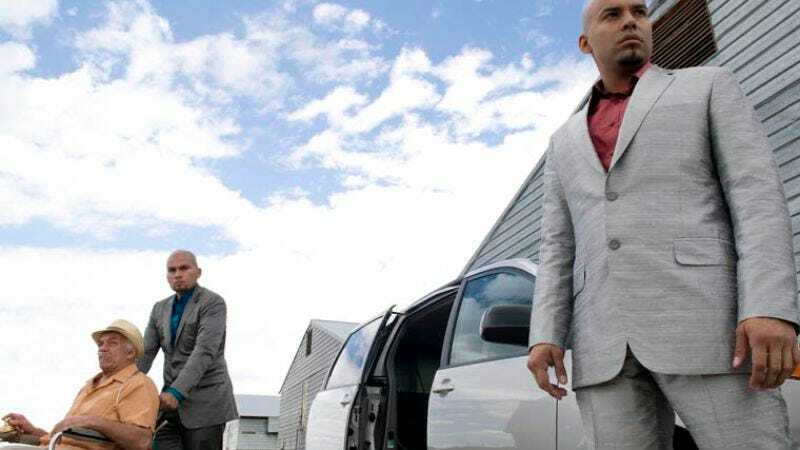 Last week's episode put the Cousins on the fast track to revenge on the man who threw a wrench in the cartel's business. This week the express train across the border slows down just in time for the White marital conflict to heat up. And of the two sorts of episodes — expository and dialogue-driven versus meditative and psychological, respectively — the latter displays most thoroughly what is special about this show. Consider "I.F.T," an acronym whose meaning is only revealed in the final line of the episode. Its genius lies in its penetrating gaze inside each character, some at their most vulnerable, others staring out from behind a carefully-constructed protective shell. "I.F.T." is all about control. That's a besetting problem of mine, too, which is probably why I watched in gape-mouthed fascination at the way it played out character by character, mostly in the spaces between their words. Let's take it one person at a time. Gus: The Cousins work for Juan, aka El Jefe, a balding Panama-hatted cartel boss who, in the opening flashback, directs them to dispense justice on Tortuga for being a "big talker" (translation: working with the DEA). 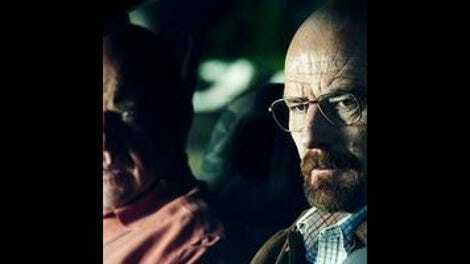 Now Gus has to meet with them and with Tio, the patriarch of the cartel family, to smooth over the difference of opinion that has arisen between their organization and his regarding Heisenberg's fate. Gus — who welcomes his guests to his chicken operation just as I welcome all my guests: by peeling the plastic off of a vegetable platter — insists he is still working with Heisenberg (although "I don't know him by that name"), so the hit has to wait until their business is concluded. Does Gus have control of this situation? He's cool as ever, but he's not quite telling the truth, since the last he heard from Walter was "No mas." And El Jefe warns (a) Gus's business with the dead man had better be concluded quickly, and (b) the Cousins may not abide by the deal. Conclusion: Gus is less in control than anytime we've seen him so far. Hank: Oh, there's big trouble in Hank-land. His boss pulled some strings to get Hank back on the El Paso task force. Which would be good news for anyone but the possessor of debilitating panic attacks like Hank's. He's sure he can't cut it in El Paso, and so he engineers some trouble in a dicey bar, egging two small-time traffickers to take a swing at him and giving them a beat-down. Control restored for the moment, in a brute force I'm-still-a-man-despite-my-abject-fear kinda way. The question is whether this apparent lapse in judgment will have more than a short-term effect. Hank's partner is going to back up his story about getting jumped, but he now knows that something else is up, since Hank deliberately left his gun in the truck before heading inside alone. Conclusion: Hank it out of control and has only the sketchiest of strategies to stay upright. Jesse: It's chilling to watch Jesse live his post-rehab life — a life where he not only lacks control, but doesn't even want it. He bunks down in the furniture-free zone of his aunt's house, agrees to contact Walter to get the old production line started again just to get Saul off his back, and spends hours calling Jane's voicemail just to hear her voice in the outgoing message. Until the moment when, in mid-call, the message cuts off. And when he redials, the number has been disconnected. She's finally, utterly gone. Does it matter to Jesse what he does? There's the RV out in the desert, there's the equipment, there are the people who want him back in business. What the hell. Conclusion: Jesse doesn't care to be in control. He'll be a tool of others' plots for him until he values his own life again. Walter: So now we know what Walter was doing breaking into the house last week. He was moving back in. Knowing that Walter Jr. wanted him back gave him the leverage he needed to regain the upper hand in his marriage. And when Skylar comes home, he demonstrates that he doesn't care about her disapproval anymore. He dares her to call the cops on him, and when Walter Jr. comes home from school in the middle of the drama and greets his father enthusiastically, Walter slides effortlessly — gleefully — back into the patriarchal role. "You want a grilled cheese?" he asks Skyler after announcing he's making them as a father-son treat. Walter's entered a whole new relationship with his quest for control. No more desperation, no more cover-ups, no more anger. (Well, except for the anger he betrays by peeing spitefully in the sink after Skyler shuts him out of the master bedroom.) He presents her with the bag of money and plays the "I did it for my family" card. When we see him next, he's all the way back — "the master chef," as Saul puts it in another context entirely, apron-bedecked, pot roast in the over, tossing a salad. "I feel really good about our talk this morning, and I'm really eager to hear what you're thinking about what we talked about," he says easily. "Honesty is good, don't you think?" There's a reason the episode is named after Skyler's response. This is her story of control lost and control regained. I don't think Skyler's had a better moment in the series than her extended phone call to the police, punctuated by blatant but wordless pleas to Walter to call off the bluff and not make her go through with it. Even the police pity her, as the reality of the situation chips away at her claim to have the right to control access to the house. There's no divorce, no legal separation, Walter's name is on the title, and she can't yet — despite her pledge to Walter that she was willing to go nuclear — play the meth card on the table where it matters, lest she lose Walter Jr. forever. She tells the attorney, but can't take her excellent advice about the next step. So passive has she become that she hopes Walter's cancer will recur, and "things may resolve themselves on their own." Without any idea how it happened, Skyler has gone from a woman with the moral high ground that comes from being wronged, to a woman marginalized in her own house. So she retakes control the only way she knows how — by striking at Walter's beloved family-man positioning. "I did something that betrays this family because you did too, even though you insist on pretending otherwise," she is saying. "You've removed me from an active role in this house, so I took an active one where I could — that 'part-time bookkeeper's salary' you pooh-poohed this morning." It's still a game. And two are playing at it, across the kitchen counter or across Gus Fring's table. Expect control to shift, and shift violently. Walt retrieves the pizza from the roof as his first "daddy's home" act. Under the influence of gravity, the toppings have all slide toward the gutter. Ewwwwwwwww. Skyler clearly hates the kiddie CD she's playing for the baby as she drives home. Someone needs to tell her that you don't need to play kiddie music for pre-linguistic infants. Or maybe she's doing the Baby Einstein thing in another manifestation of her desire to engineer her own life and her family's outcomes. The Cousins are very choosy about the vehicles they boost to get around on this side of the border, taking a Jazzy-riding bingo-playing granny's lift-equipped minivan the better to haul Tio — excuse me, Don Salamanca — out to the chicken farm. That duffel bag full of money is going to pay for college tuition, health insurance, physical therapy for Walter Jr., SAT tutors, groceries, gas, graduation parties, and the mortgage on the ranch house Walter broke into yesterday. And Skyler need not have any qualms about accepting it because "I didn't steal it; it doesn't belong to anyone else; I earned it." Skyler refuses control when the policeman asks: "Is it possible maybe he's broken any laws that you know of … anything at all …?" She makes a naked grab for it when she asks Ted: "Are your kids home?"